Is it possible in Minecraft to switch over from survival to creative in single player? This question is regarding the minecraft Beta 1.8 prerelease -- I have a beautiful house in single player survival which I'd like to record while flying. I think this would be possible through editing your level.dat file as I think that's where the game mode for the map is stored. You can abbreviate the modes. 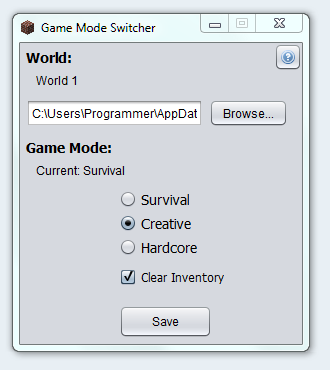 For example, typing /gamemode c for Creative works as well. You can only do this if you haven't disabled cheats during world generation, though. If you turned cheats off and still want to do it for whatever reason: The game mode is stored in the level.dat file, which can be edited using an NBT editor, such as NBTExplorer. The game mode is stored in Data/GameType. I've found another tool (NBTEdit was unavailable when I tried to download it, so I poked around for alternatives). The Game Mode Switcher Is exactly what it says on the tin. It's a simple, external application with the added option of culling your inventory when you switch modes. 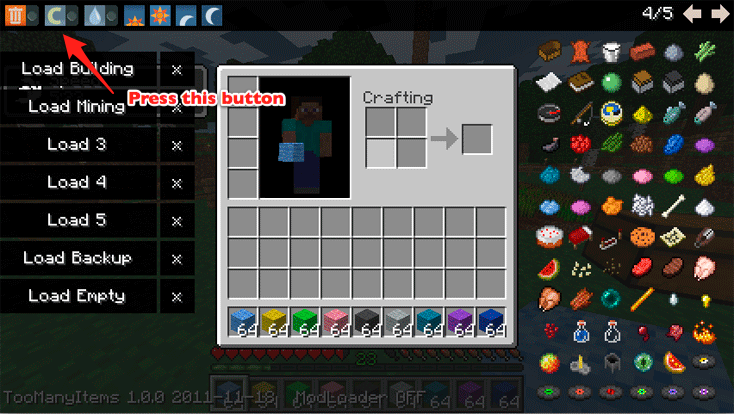 You can use /gamemode 0|1 now by starting your world with "Cheats Enabled". Without Mods or software? Try Dumping your inventory in a chest, Create a new world that is creative mode, copy the level.dat in your new world to your old one (yes overwrite the old level.dat) then delete your new world as it was only temporary and you have no uses for it, then play your world, sorry if it bugs people that this is all 1 sentence! Also note this will change your seed so input your old seed for the same generation or use a new one for some excitement! Is there a way to switch between adventure mode and creative mode in Minecraft? How can I switch from Survival to Creative? How can I edit the .DAT files in the PlayerData folder in minecraft? My village appears to be a ghost town. How do I get my people back? How to make an Enderman stay? Where is the world saved on a Minecraft server, and how do I back it up? What music discs are available in Single Player Survival? How to view complete overhead map of Minecraft 1.8 server world?